Companies that conduct their business either in an entirely online setting or in hybrid environments (i.e., online and face-to-face) are in a unique position in today’s global economy. They are poised to take advantage of the Internet’s flexibility both for assisting their clients and for hiring the best workers available regardless of geographical location. They also are in a unique position when it comes to training and preparing their workers to assist those clients. However, many such companies do not have principle-centered training materials that they can adapt to meet their own institutional needs. This chapter provides employers with such training principles, ones that have been substantiated by practice and research from various professional fields and that have been successfully used in an Internet-based business that employs hundreds of part- and full-time individuals. 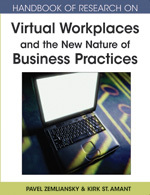 Specifically, this chapter provides readers with: (1) an educational and financial rationale for conducting online human adaptive training for virtual workplaces; (2) an understanding of training/professional development principles and strategies for online employees in virtual businesses via one-to-one and/or group human adaptive settings, and (3) an understanding of how to scale such training processes efficiently and with measurable results gleaned from qualitative and quantitative methods. Investigation: An online training principle regarding the need to strategically and intentionally explore the efficacy of the training processes for the participants involved and, in turn, a company as a whole. Investigation also addresses the need for more empirical research about the effect of the online medium on various work processes. Individualization: An online training principle regarding tailoring training activities to meet the needs of individual participants. Within the online training context, employers can reconcile the operational requirement for standardization with trainees’ needs for flexibility or individuality as they progress through training. Online Human-Adaptive Training: Internet-based training or professional development programs for individuals or employees in various contexts. Such programs require the involvement of person-to-person contact (in, for example, asynchronous or synchronous modes) throughout training activities. Reflection: An online training principle regarding the potential of training to be a thoughtful and iterative process during which trainees’ assumptions about their work product and processes are identified, challenged, and potentially refined. More complex than merely “thinking about” one’s practice, “reflection” means that programs can account for how and when trainees consider their practices and then use such accountings to improve both employee practice and training program goals. Immersion: An online training principle regarding the process of engaging trainees firsthand in the online environment throughout training activities. When training is designed to include immersive Internet-based activities that reflect the online environment in which trainees will ultimately work, employees can transition into their online work more efficiently. Principle-Centered Training Framework: The overarching operational and/or educational tenets that inform the design and implementation of an online training program. Such overarching principles can be applied to various training modalities—whether a program involves asynchronous e-mail, synchronous messaging, or particular commercial software for an orientation classroom- or Internet-based networking platform. The result is a qualitatively strong, yet “contextually adaptive” training program that will remain structurally sound despite a company’s technology changes, upgrades, and/or program developments ( Hewett & Ehmann, 2004 ).